"I am sure there never was a people, who had more reason to acknowledge a divine interposition in their affairs, than those of the United States; and I should be pained to believe, that they have forgotten that agency, which was so often manifested during our revolution, or that they failed to consider the omnipotence of that God, who is alone able to protect them." -George Washington, Letter to John Armstrong, 11 March 1782, in Ford's Writings of George Washington (1891), vol. XII, p. 111. The first amendment to the United States Constitution reads "Congress shall make no law respecting an establishment of religion, or prohibiting the free exercise thereof; or abridging the freedom of speech, or of the press; or the right of the people peaceably to assemble, and to petition the Government for a redress of grievances." Freedom of speech is one of those blessings that sets the United States apart from other nations across the Earth. Though many nations have adopted similar freedom of speech laws, the United States was unique in pioneering such personal liberties. Every year on the 4th of July the country celebrates the victory of the continental army against the forces of tyranny in 1775-1776. And of course the declaration of Independence from Great Britain. Two of the founders of the USA, John Adams and Thomas Jefferson both died on July 4th, on the same day of the same year. Thomas Jefferson's last words were "Is it the fourth?" Both Adams and Jefferson served as presidents of the United States. It's fitting on the 4th to remember the sacrifices made by the founders of the nation. Many were deeply devout Christians (Adams, Washington) and others weren't (Franklin, Jefferson). But they were never-the-less friends and allies, seeking to overthrow a tyrannical government, and to replace it with a government of laws, operated by the people, under God. Today that system has largely been co-opted by special interest groups, big business, and big banking. It is a tragedy beyond proportion. Who can measure it? The Supreme court has walked on many a right in it's time, especially in the last one hundred years. Roe v. wade, Citizens United, and Free Speech zones are just a few examples of the attacks on personal liberty from the Federal level. Are the Democrats to blame? Not necessarily. Though President Obama has presided over many attacks on freedom and liberty such as the NDAA, gun control, IRS targeting conservative groups, Obamacare, and religious liberty violations. President George W. Bush presided over many of the same attacks during his presidency, such as the Patriot Act, mass surveillance, the Military Commissions Act, and of course bailouts to failing businesses. The British walked on the rights of the colonists on a daily basis. The colonists were forced to quarter British troops in their homes. They were required to pay taxes without representation in parliament. Under British law, criticizing the government was a crime. Freedom of speech was deeply restricted. Those and other causes led to the American revolution. Americans customarily light off fireworks on the 4th of July. Those blasts of light, noise, and explosion remind us the cost of liberty and independence of thought and action. As many have said, "Freedom isn't free at all." Or as Thomas Jefferson wrote in a letter to Williams Stephens Smith (13 November 1787) "The tree of liberty must be refreshed from time to time with the blood of patriots and tyrants. It is it's natural manure." Today in the United States we see that some of the foundational liberties of our republic are under attack. There have been issues on the Federal level of mass surveillance. There have been problems with the IRS targeting certain groups for audits, while ignoring others. NSA wiretapping has been a concern. And in the past few years religious freedom has come under attack by government and gay activists. As religious persecution grows in Europe, the United Kingdom, and Canada, such attacks are now growing in the United States. 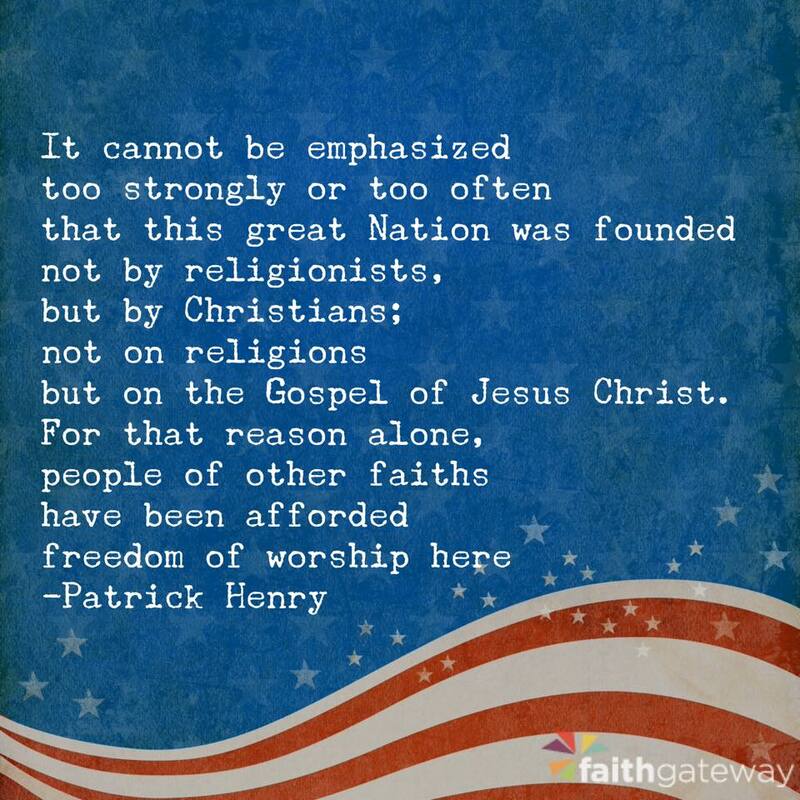 One of the foundations, the very cornerstones of the United States is religious liberty. Back to the very first colonists of the Americas, Protestant Christian denominations (Puritans, Quakers, Ana-baptists, etc) sought a place where they could freely engage in their religious practices without persecution. It's very important for all Americans, Christians and non-religious alike to stand for the protection of religious freedom. That means all aspects of religious practice. Religious freedom must by definition include the practical application of that faith in business practices, in the public square, and of course in private. But it can't be religious freedom in private only. That is no freedom at all. Those Christians seeking to practice their faith must be free to do so in the business world. That is the current issue on the table today in the United States. Which right supersedes the other? The right to refuse service based on religious beliefs, or the right to equal service no matter what your sexual preference may be? Religious freedom is important and equality is also important. But which trumps the other? Should Christians be forced to marry homosexual couples when such a union goes expressly against the core teachings of the Bible? (Leviticus 18:22, Romans 1:26-28). That would most certainly qualify as a "sin" for a Christian minister to bless such a union by presiding over it. Should Christians be forced to hold such weddings, despite their religious beliefs? Or might the homosexual couple need to respect the religious views of such persons and go to a different church or institution for their wedding ceremony? We all fear where this could be heading. Many Christians have lost their jobs due to the equality activism of gay activists. These activists have gathered a great deal of power and influence behind their cause. The CEO of Mozilla Firefox was forced to resign. There was controversy related to Stephen Colbert and his show, something he tweeted I believe, and his show was cancelled. Activists managed to dig up some dirt on Josh Duggar, and his life went up in flames. Indiana tried to pass a rather routine religious liberty bill passed in dozens of other states (in the past supported by President Bill Clinton), but gay activists raised the noise and the bill was altered to accommodate the powerful. George Takei and others assaulted the dissenting judges in the recent gay marriage ruling of the Supreme court calling one of the African-American dissenting judges a "clown in black face." Do you notice something? I had been trying to put my finger on it. For a while it alluded me. But the LGBT movements had gathered around the word "tolerance." You need to tolerate our views. Tolerance, tolerance, tolerance. But the odd thing was, even if you respectfully disagreed you were labeled a "bigot" or "homophobe" or "hate criminal." They call out "love is love" yet do you notice something? They are the ones breathing out hatred and bigotry. They just have different targets. Those crying for tolerance display the penultimate intolerance and bigotry against Christians, conservatives, and conscientious dissenters. Instead of engaging in respectful debate, they apply "Ad hominem." Ad hominem is a logical fallacy in which one attacks the character of the one raising the objection instead of providing a counter-argument. They raise the noise, shout down the opposition, and demonize the opposition as "hateful" "bigoted" and "intolerant." Yet the conduct of many in the LGBT movement could be characterized easily as hateful, bigoted, and intolerant toward Christians, religious individuals, and anyone who raises any sort of objection. Such attacks on Christian business owners and the like represent a new intolerance against those of religious persuasion. In 2008 I noticed that many core liberties and freedoms described in the Constitution were under attack by Neo-Conservative Republicans in the Congress, and by George W. Bush. I watched a young charismatic Democrat running for the President in 2007-2008. He talked a lot about personal liberties, civil liberties, and returning to the Constitution. He talked a lot about scaling back the war-corporatism and nation building overseas. He talked about dealing with the corruption on Wallstreet and in Washington D.C. He said, "Lobbyists will have no place in my administration." He said "Whistleblowers need protection." I voted for Barack Obama in 2008, praying and hoping for "hope and change." Despite all the wonderful things Obama had said in 2008, he did quite the opposite. His cabinet is full of lobbyists from Monsanto to Federal Reserve lawyers, there are many. The Obama administration has gone after whistle blowers worse than Bush's administration did. The Obama administration has done a great deal of damage to the Constitution, just from different angles than Republicans. The attacks on the Constitution just have more liberal after-tastes to them. And from a party that had supposedly championed civil liberties, liberty vanished from the platform all together in 2012. And despite all of President Obama's words in speeches regarding Wallstreet, his actions showed clear support for his buddies at Goldman Sachs and J.P. Morgan. I watched the solidarity movements in Wisconsin receive no support from President Obama, and the Occupy movements also received nothing but lip service from the president, while they were bulldozed from the major cities one by one, and quietly ignored by the mainstream media. And as if, in a final act to show himself as a true status-quo President, Obama recently came out encouraging Congress to re-authorize the Patriot Act while Rand Paul kept it held up in the Senate. It's important we understand these issues as Christian and conservative voters. In the coming 2016 election the divide is not so much between Republicans and Democrats, but more so it is between establishment candidates and grassroots candidates. Establishment politicians represent the status-quo, authoritarian government, and tend to vote with big business and big banks. On the Democrat side the status-quo candidate is of course Hillary Clinton. One need not look far to learn about her corruption. On the Democrat side the grassroots candidate is Bernie Sanders. Though I tend to disagree with Bernie Sanders on a lot of things, I respect him and others on the Democrat side like Elizabeth Warren and Dennis Kucinich because they are honest, true liberals. They care about their constituents and vote with their minds on the issues. On the Republican side, the status-quo candidates are Jeb Bush, Marco Rubio, Chris Christie, and the governor of Wisconsin Scott Walker. These are candidates who will vote with their buddies in big business and big banking. They tend to be war-hawk style neo-cons big on money and slow on liberty. Then we have the Republican grassroots candidates, truly inspiring individuals like Rand Paul, Ted Cruz, and Ben Carson. Rand Paul is the most libertarian candidate, very anti-establishment which I like. Ben Carson and Ted Cruz's religious convictions and views on Israel make them likely favorites for evangelical voters. Pray carefully before casting your votes, these are critical moments for our wonderful country. I love the United States. It has provided us with a bastion where we are freely able to practice our Christian faith. And others may practice their faiths freely as well. We can't under-estimate how wonderful that is. At least fifty-three countries are deeply hostile to the Christian worldview (maybe you've seen the t-shirt "this shirt is illegal in 53 countries"). There was an article on the Washington Post today decrying patriotic sermons, but on the fourth of July we have a lot to be patriotic about. But it's true that we are not citizens of the United States, but citizens of heaven; we are foreigners traveling through this world. After the recent Supreme court ruling my mother said she felt she had just been "flushed down the toilet." I think many of us can relate to feeling much more "foreign to the world" after that day. I often ask myself, what will the future be? Will it be that we turn the tide and trigger a massive reformation of the United States leading to a great awakening of Christian faith? Or is this that time in history when culture will continue to nose dive into depravity and sexuality, followed by the collapse of the United States itself? It makes me ask these questions within my mind, questions like... what world will my children wake up within? What about their children? What will God do to deal with all this chaos in the USA? History has shown God does deal with corrupt nations. What does that mean for me personally, and my family, and the Christian remnant in the nation? The honest answer is... I don't really know. And if theres something we desperately need in this nation, it's honest people, pursuing the truth, honestly working for the common good, incorruptible in their political character. On both sides of the aisle. Hopefully if we pray hard enough, and God answers those prayers, then things may change in this country. 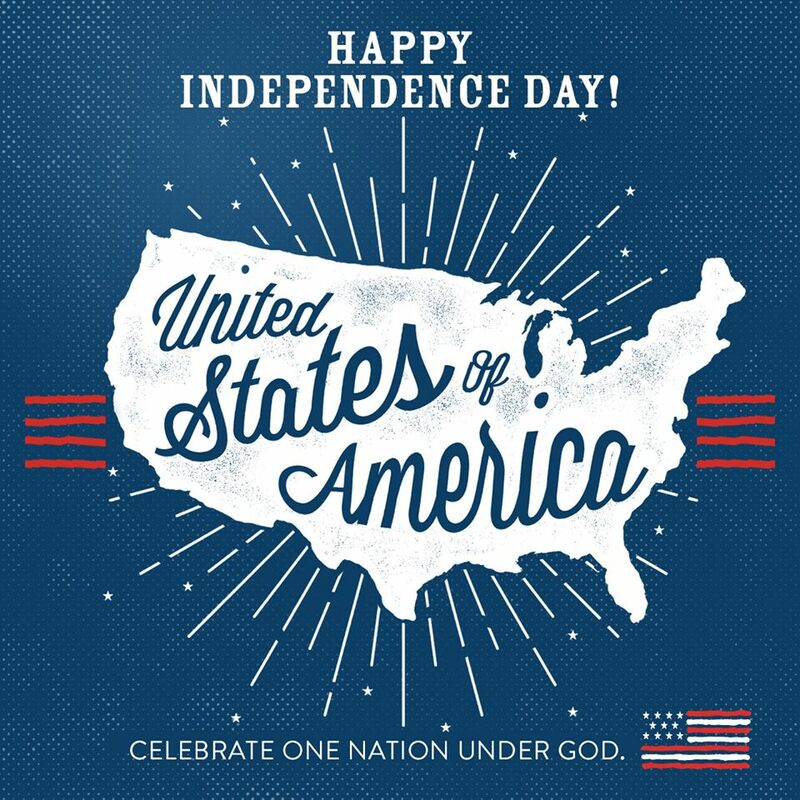 On the fourth of July 2015, these have been some of my reflections. In conclusion, happy fourth of July. As you watch the fireworks, reflect on the cost. Reflect on the gratitude we all ought to feel for the freedom of speech we have in this country. Stand up for that freedom of speech, despite the new intolerance. Stand up for freedom of religion in all spheres of life. God bless America.